This post will cover the Autumn Equinox / Mabon ritual and celebration held by the Circle of Fountains. To see the Circle of Fountains 2016 Autumn Equinox ritual, click here! This year's equinox ritual was led by Andrea! Each sabbat, a different Circle of Fountains member writes and leads the ritual. Each member has a different belief system or practice and often incorporates that into their celebration. 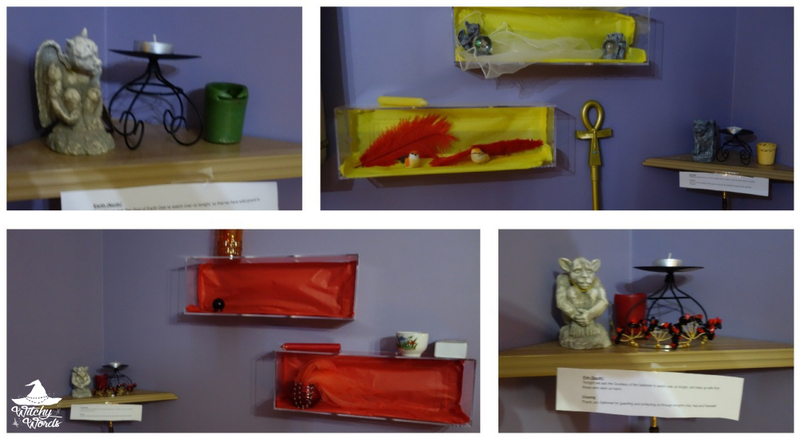 Andrea has written for Witchy Words in the past about her Egyptian-influenced pagan beliefs. You can check out that article here. Though her personal beliefs are strongly influenced by Bastet and Seth, you'll find that her rituals are inclusive of the variety of CF member paths. The celebration began with a potluck feast put together by all attendants. We had everything from chicken to potatoes, carrots to corn and even desserts made of apples and pumpkins! After dinner, we began on our ritual crafts! Each circlemate received a packet filled with everything they needed to create their crafts. In the first craft, we created a scroll on papyrus. We were asked to write various statements, such as things we planted this year that didn't turn out or things that did more damage than good. We then sat those aside to create miniature mummies! 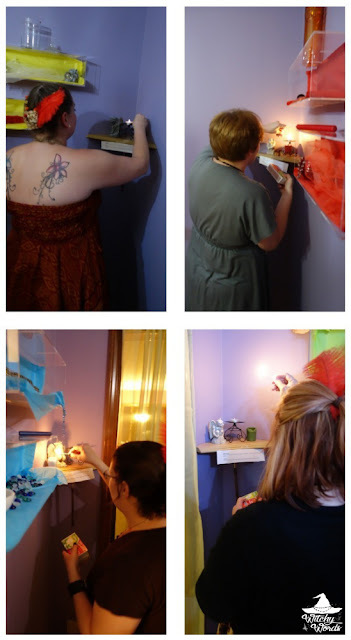 After crafting was complete, Andrea asked that we take our papyrus and enter the ritual area. For this particular ritual, Andrea hosted it at her house. It gave us an opportunity to see her personal ritual room. Here's some highlights! We began by calling the quarters utilizing Egyptian gods that properly corresponded with each direction. As a holiday of equal day and night, Andrea celebrated the equinox as a time to find inner balance. Representing that balance was a feather and scale, an ode to Ma'at who is the goddess of truth and justice. In ancient Egypt, your heart would be weighed against the feather of truth to determine if you were worthy. Also awaiting you at the scales would be Anubis, who would place your heart on said scales, Thoth, who would document the information and Ammit, the devourer of the dead. On the table were figures that represented each of these gods, goddesses and demons. Andrea asked us to take our papyrus and roll them into scrolls. Then, using wax and a candle, we sealed our scrolls and set it with a small heart. This ritual, however, was not about judging our lives. We judge ourselves enough every day. Instead, if the scrolls were lighter than the feather, our struggles would take longer to come to resolution. If they weighed more than the feather, then they would be resolved quickly. As we went around the room, we discussed our regrets and concerns of the past year. And not everyone's scroll was heavier than the feather. Once everyone's scrolls had been weighed, that concluded Andrea's ritual! We released the gods at he quarters and completed our celebration. From my family to yours, I hope you had a thankful and grateful equinox! 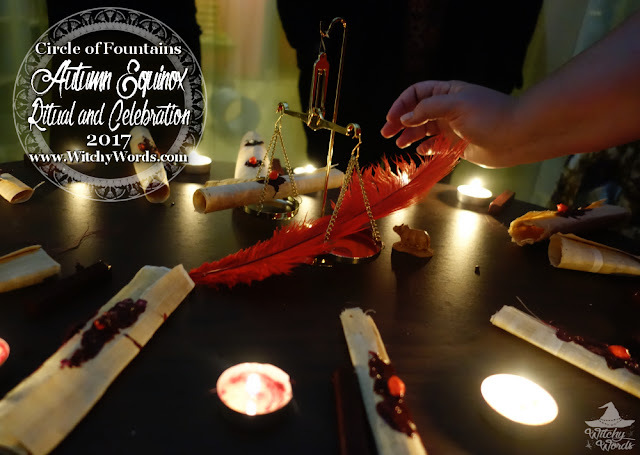 To see the previous Circle of Fountains sabbat ritual, August Eve, click here! For all sabbat related entries, click here! Like this article? Want to give back? Buy me a cup of coffee! Thank you so much, Stephanie! I'm so glad I could help! I'm Marietta, a nontheistic witch mixing modernity with traditional practices. My blog focuses on my journey with my familiars and connected spirits, diving deeper into my work with the Man in Black and my psychopomp guide D. Here, I present my rituals, altars and spells as needed while exploring witchcraft theory and history. I sincerely hope I can help you on your journey! Help me create more and better content by simply buying me a cup of coffee! For my Spirit Work New Years ritual and goals, click here.